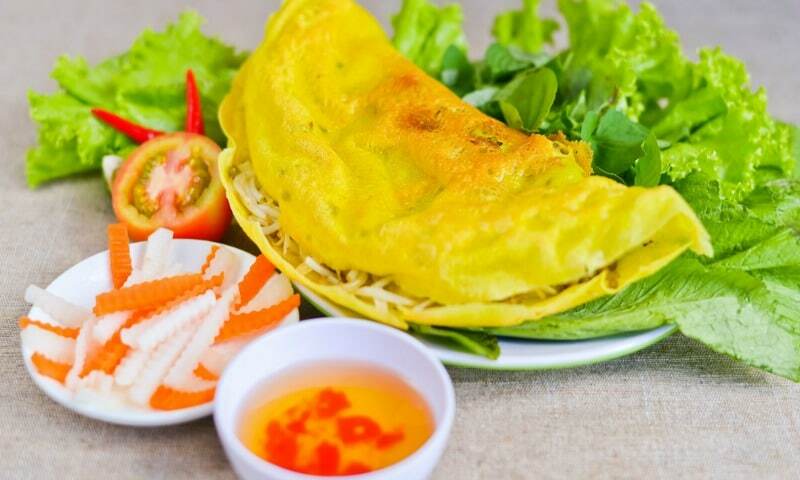 Vietnamese crepe recipe known as BanhXeo is a famous traditional food in Vietnam. It is a beloved food of Vietnamese and also many visitors and foreigners. 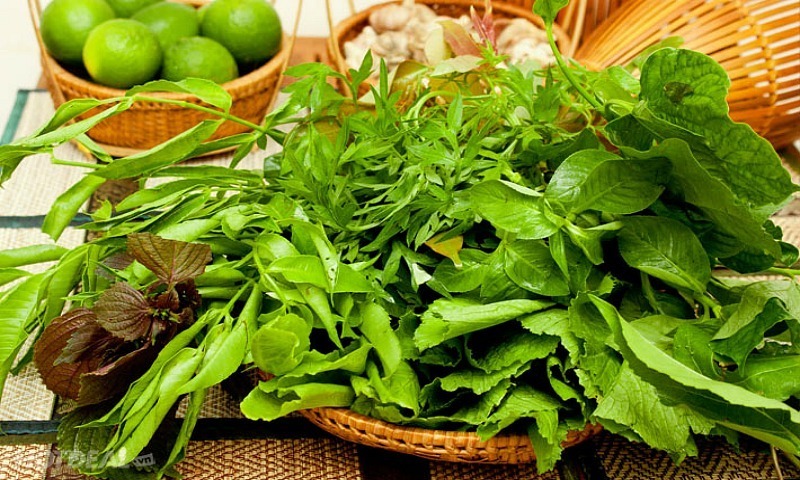 People can find “BanhXeo” in many provinces and regions throughout Vietnam, however, each may have a particular flavor. In the Southern region, the Vietnamese crepe recipe has yellow color because of the added turmeric powder. To make Vietnamese crepe recipe tastes more deliciously, people also add coconut water or coconut milk. 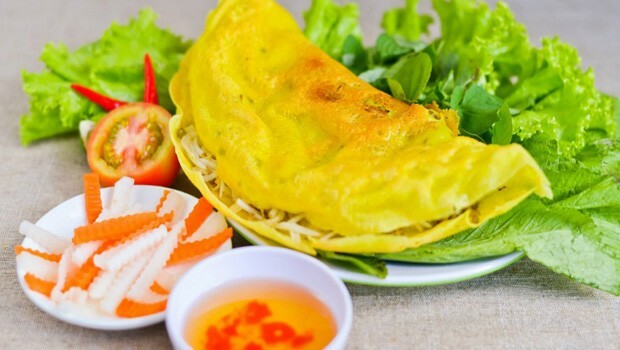 Then, it is so easy to enjoy the delicious Vietnamese crepe recipe in large dishes at many Vietnamese restaurants, but how about preparing Vietnamese crepe recipe at home? 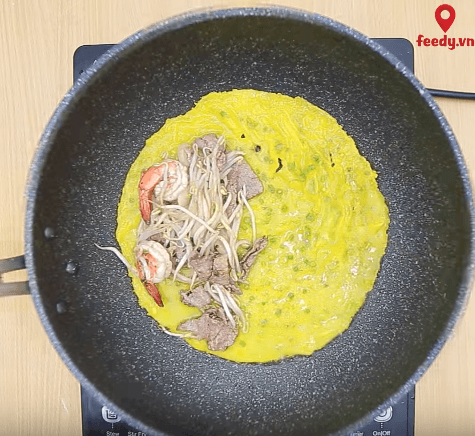 In this article today, I would like to show you how to make the delicious savory Vietnamese crepe recipe at home with just easy-to-find ingredients available in your kitchen. Keep reading! Mix rice flour, salt, and turmeric powder. 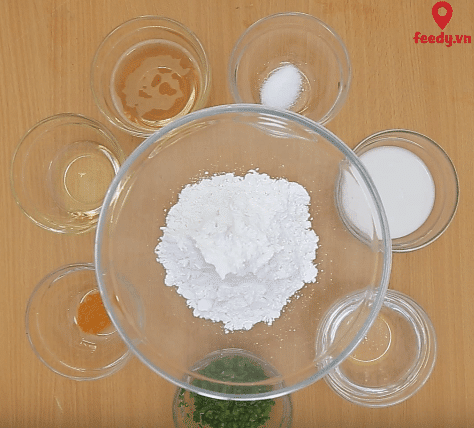 Put this mixture in a bowl and then add water, beer, and flour. You should add it slowly until the mixture becomes a smooth paste. Chop spring scallion leaves and then add them to the flour mixture. Leave it to sit for about 30 minutes. Rinse prepared vegetables under the running water. After boiling the pork, slice it into thin pieces. Add salt, sugar, sodium glutamate, and fish sauce to the cooked shrimp and pork and then leave it for 30 minutes. Spread the cooking oil over the surface of a pan and heat it. Fry chopped onions before adding shrimps and pork. When the shrimp and pork are cooked, you put them into a bowl and then leave it aside. Heat the oil in the pan. Spread the flour over the pan and the cover it for a minute. Add the filling of Vietnamese crepe recipes (cooked pork, shrimp, dried mung beans, bean sprouts, and onions). Cover it and let it simmer for 2 minutes. When the crepes become crisp, you fold it in half and then transfer it to a clean plate. Now we have delicious Vietnamese crepe recipe. It is great to serve when it is still hot. This crispy Vietnamese crepe recipe should be served with raw vegetables and herbs after being soaked in the dipping sauce. Enjoy! Thank you for reading. You should feel free to ask any questions. I will answer as soon as I can.